VW's been having fun with little MQB-platform based off-road concepts, like that new Beetle Dune concept we saw earlier this year in Detroit. Now they're revealing a new one in Geneva called the T-ROC, and it's an awful lot like a modern Golf Country. That's doubleplusgood, if you ask me. The T-ROC (not to be confused with the corrugated box equipment manufacturing concern) has been seen before in concept sketches, but this is the first time we've seen it in the painted metal-flesh, and it's pretty great. Mostly because of that targa-top design. The removable roof and the pillar-less windows make for a very open-feeling car without the usual convertible structural issues. Also, unlike the Porsche take on the targa, the VW's roof panels just come out with human meat-power and stashes in the trunk as opposed to the complex robo-arm system of the Porsche. The progressive design of the front end demonstrates a new approach to compact SUVs by the Volkswagen brand. The T-ROC can be driven in three different driving modes: "Street", "Offroad" and "Snow". Will this thing make it into production, or is it just another of VW's cruel teases? Technically, it seems very feasible, and isn't using anything exotic. So, maybe VW will decide the world needs a Juke killer and we'll get to play with these fun looking little goats? I hope so. 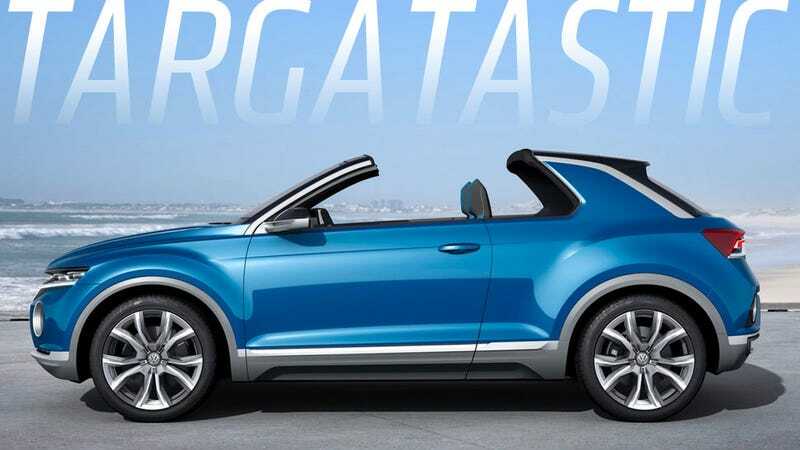 You know, even without the 4WD and chunky grille and big tires, the targa top/pillarless windows combination would make a wonderful Golf variant on its own.